Markets are constantly on the move. They go up and down on a whim, but a smart investor understands that these fluctuations are inevitable. With patience and stability, one can use market volatility to their benefit. I can’t wait. All my friends have already bought. BUY! Wow! What a great pick! There is something wrong; should I sell & enter at lower price? What is government & SEBI doing about small investors like me? Thank god. I got out in time. I’ll never buy stocks again. Fundamentals are bad, there is no justification in the rise. I will keep out. It seems the economy is doing very well. Should I buy? Be it exercise or stock markets, pain is followed by gain. The pain of market correction may tempt you to redeem but history shows that if you can withstand this temporary falls (Red dots) and stay invested in a portfolio of quality stocks, you will come out stronger. The power of equity can be harnessed, but only with time. If you also combine it with the power of compounding it becomes a potent wealth creation machine. The rule of 72 states the number of years it takes for your money to double. 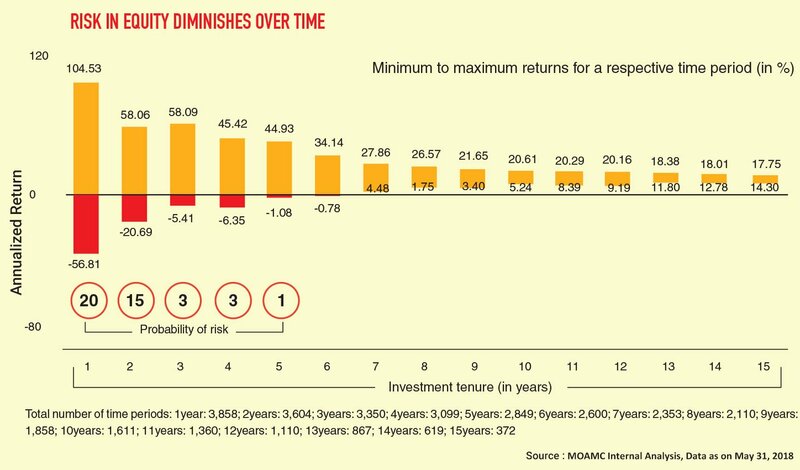 By that yardstick taking long term equity returns into consideration, your money could double every 5 years at 18% compounded returns. Disclaimer: This calculator is meant to be used for illustration purposes only and to assist the investors in calculating the appropriate amount of their prospective investments. This calculation is generated on the basis of the information provided by the users. The results generated by the calculator shall not be construed as a reference to the current/future returns for any of the products and services of Motilal Oswal AMC. This calculator alone is not sufficient and shouldn’t be used for the development or implementation of any investment strategy. The calculator does not warrant the completeness or accuracy of the figures calculated. Users shall be fully responsible/liable for any decision taken on the basis of this calculator. Investors are advised to consult his/her own professional financial/tax advisor before making any investment decisions. Equity markets have given 18% compounded returns since inception. In good and bad markets. Now isn’t that worth the wait? Volatile markets can test the resolve of the most seasoned investor. 30 years of riding turbulent markets has taught us: you need to have an eye for quality stocks (Buy Right) and the patience to hold onto them (Sit Tight). This is what we practice in our portfolios. And this is what differentiates a seasoned market player. Buy and Hold: We are strictly a buy and hold investor and believe that picking the right business needs skill but holding onto that business is where our expertise lie. Focus: We have high conviction portfolios with 25 to 30 stocks being the ideal number. We believe in adequate diversification since over-diversification results in diluted returns and increased market risk for our investors. Date of inception: 13-May-13. ● Incase, the start/end date of the concerned period is non business date (NBD), the NAV of the previous date is considered for computation of returns. The NAV per unit shown in the table is as on the start date of the said period. Past performance may or may not be sustained in the future. Performance is for Regular Plan Growth option. Different plans have different expense structure. ● Mr. Siddharth Bothra is the Fund Manager for equity component since 23-Nov-2016; ● Mr. Gautam Sinha Roy is the Co-Fund Manager for equity component since 26- Dec- 2016 and Mr. Abhiroop Mukherjee is the Fund Manager for debt component since inception. ● *The performance of all the schemes of Motilal Oswal Mutual Fund is Benchmarked to the Total Return variant of respective Index chosen as Benchmark as against Price Return variant of respective Benchmark Index. Date of inception: 24-Feb-14. ● Incase, the start/end date of the concerned period is non business date (NBD), the NAV of the previous date is considered for computation of returns. The NAV per unit shown in the table is as on the start date of the said period. Past performance may or may not be sustained in the future. Performance is for Regular Plan Growth option. Different plans have different expense structure. ● Mr. Akash Singhania is the Fund Manager for equity component since 28-Jul-2017; Mr. Niket Shah is the Associate Fund Manager since March 1, 2018 and Mr. Abhiroop Mukherjee is the Fund Manager for debt component since 24-Feb-2014. ● The scheme has been in existence for less than 5 years. ● *The performance of all the schemes of Motilal Oswal Mutual Fund is Benchmarked to the Total Return variant of respective Index chosen as Benchmark as against Price Return variant of respective Benchmark Index. Date of inception: 28-Apr-14. ● Incase, the start/end date of the concerned period is non business date (NBD), the NAV of the previous date is considered for computation of returns. The NAV per unit shown in the table is as on the start date of the said period. Past performance may or may not be sustained in the future. Performance is for Regular Plan Growth option. Different plans have different expense structure. ● Mr. Gautam Sinha Roy is the Fund Manager for equity component since 5-May-2014; ● Mr. Siddharth Bothra is the Co-Fund Manager for equity component since 23-Nov-2016, Mr. Abhiroop Mukherjee is the Fund Manager for debt component since 28-Apr-2014 and Mr. Swapnil Mayekar for Foreign Securities since 10-Aug-2015. ● The scheme has been in existence for less than 5 years. ● *The performance of all the schemes of Motilal Oswal Mutual Fund is Benchmarked to the Total Return variant of respective Index chosen as Benchmark as against Price Return variant of respective Benchmark Index. Date of inception: 21-Jan-15. ● Incase, the start/end date of the concerned period is non business date (NBD), the NAV of the previous date is considered for computation of returns. The NAV per unit shown in the table is as on the start date of the said period. Past performance may or may not be sustained in the future. Performance is for Regular Plan Growth Option. Different plans have different expense structure. ● Mr. Gautam Sinha Roy is the Fund Manager for equity component since inception; ● Mr. Siddharth Bothra is the Co-Fund Manager for equity component since 26- Dec- 2016 and Mr. Abhiroop Mukherjee is the Fund Manager for debt component since inception. ● The scheme has been in existence for less than 5 years. ● *The performance of all the schemes of Motilal Oswal Mutual Fund is Benchmarked to the Total Return variant of respective Index chosen as Benchmark as against Price Return variant of respective Benchmark Index. Date of inception: 27-Sep-2016 ● Incase, the start/end date of the concerned period is non business date (NBD), the NAV of the previous date is considered for computation of returns. The NAV per unit shown in the table is as on the start date of the said period. Past performance may or may not be sustained in the future. Performance is for Regular Plan Growth Option. Different plans have different expense structure. ● Mr. Gautam Sinha Roy is the Fund Manager for equity component since 23-Nov-2016; ● Mr. Siddharth Bothra is the Co-Fund Manager for equity component since 23-Nov-2016 and Mr. Abhiroop Mukherjee is the Fund Manager for debt component since inception. ● The scheme has been in existence for less than 3 years. ● *The performance of all the schemes of Motilal Oswal Mutual Fund is Benchmarked to the Total Return variant of respective Index chosen as Benchmark as against Price Return variant of respective Benchmark Index. ● Investment in a maximum of 35 equity and equity related instruments across sectors and market capitalization levels.